The Sudden Oak Death (SOD) Specialists group is a partnership between UCCE, Master Gardeners and UC Berkeley. Master Gardeners receive specialized training to provide public outreach programs, such as SOD presentations and information tables at events, to disseminate the most current scientific information and best management practices in response to Sudden Oak Death infestations. Each year we host a "SOD BLITZ" with UC Berkeley. This is a Citizen Scientist approach that includes collection of plant samples for the UC Laboratory for testing of the disease and mapping the spread of the disease in Sonoma County. 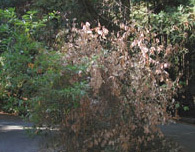 Sudden Oak Death is caused by a funguslike pathogen identified by UC scientists as Phytophthora ramorum. The pathogen was also discovered in European nurseries in the mid 1990s, and it has since spread to wildland trees in the U.K. and the Netherlands. Although the first P. ramorum-infested California nursery stock was identified in 2001 in Santa Cruz County, the U.S. nursery industry was not widely impacted by the disease until 2003, when the pathogen was detected in California, Oregon, Washington, and British Columbia nurseries. Since its appearance Sudden Oak Death (SOD) has killed hundreds of thousands of coast live oak, black oak, tanoak and Shreve oak in northern California. P. ramorum is also the cause of Ramorum blight, which affects the leaves and twigs of numerous other plants in forests and nurseries. It can infect leaves and branches of rhododendron, buckeye, madrone, manzanita, bigleaf maple, bay laurel, and evergreen huckleberry. Two species of East Coast oaks, northern red oak and southern red oak, are also susceptible to P. ramorum. Possible long term threats include a change in species composition in infested forests and therefore, in ecosystem functioning; loss of food sources for wildlife; a change in fire frequency or intensity; and decreased water quality due to an increase in exposed soil surfaces. Sudden oak death has been found as far north in the state as Humboldt County and as far south as Big Sur in Monterey County. To date, SOD has been identified in 14 California counties: Alameda, Contra Costa, Humboldt, Lake, Marin, Monterey, Napa, San Francisco, San Mateo, Santa, Clara, Santa Cruz, Sonoma, Mendocino. Solano. In Oregon, Sudden Oak Death has been confirmed in Brookings, a small town in the southwestern corner of the state. Bleeding or oozing of a dark reddish-brown thick sap is the first symptom to appear on true oaks. It typically occurs on the lower portion of tree trunks (less than 10 feet) but has been found as high as 60 feet. On tanoak, the first symptom is drooping of new growth. Beetles attack weakened trees. Wood decaying fungi are seen in the later stages of decline on the trunks of oaks and tanoaks. Preventing the movement of infected leaves, wood and soil will be critical to slowing the spread of the fungus to other oak woodlands, such as the Sierra Nevada. Plant material and soil should not be moved from coastal areas. Any wood already moved elsewhere should be burned. Visitors to coastal forests should clean their tires, shoes and animals' feet thoroughly before leaving the area. Construction workers should wash equipment well and should not move dirt from one place to another. Ornamental plants, such as rhododendrons, that may be hosts should not be moved from infected counties unless certified to be free of the pathogen. The California Department of Pesticide Regulation approved a special registration for Agri-Fos fungicide in October 2003. It is currently the only chemical treatment approved by the State for use against Phytophthora ramorum infections on oaks and tanoaks. The compound is best used as a preventative measure and is NOT A CURE, but it can help protect trees from getting infected, as well as suppress disease progression in very early infections. Professional arborists, tree-care companies and pest control companies can apply Agri-Fos. It is NOT an inexpensive treatment. Click here for more treatment details. Phytophthora cinnamomi can produce identical symptoms in oak trees. Scientists differentiate this fungus from Sudden Oak Death by using a lab test. P. cinnamomi can infect about 1,000 plant species. It can kill oaks, rhododendrons and other nursery plans and agricultural crops including almond, walnut and avocado trees. The above overview was compiled from information on the UCCE--Sonoma County, and California Oak Mortality Task Force websites. Click the links below for much more detail and information, including diagnosis and sampling, treatments, sanitation and disposal, and lists of arborists and applicators.